Heat the oven to 180°C/160°C fan/gas 4. On a lightly floured surface, roll out the pastry to 3-5mm thick. Using an upturned plate as a guide, cut the pastry into a 26cm circle, then transfer to a baking tray lined with non-stick baking paper. Prick all over with a fork, then chill for 30 minutes. has dissolved. Keep cooking for a further 5 minutes or until a golden caramel forms (most of the alcohol will cook off but the caramel will keep some of its warmth). Turn off the heat and whisk in the butter – be careful it will spit (see Make Ahead). Tightly pack the figs, cut-side down, into the dish/pan on top of the caramel. They will shrink slightly when cooked, so pack them in as tightly as possible. Lay the chilled pastry over the top of the fruit, then gently tuck it inside the rim of the pan around the figs. Bake for 30-35 minutes until the pastry is puffed and golden. Remove from the oven and run a butter knife around the edge, separating the pastry from the pan. Cool for 2 minutes, then invert onto a serving plate or chopping board (one larger than the pan). 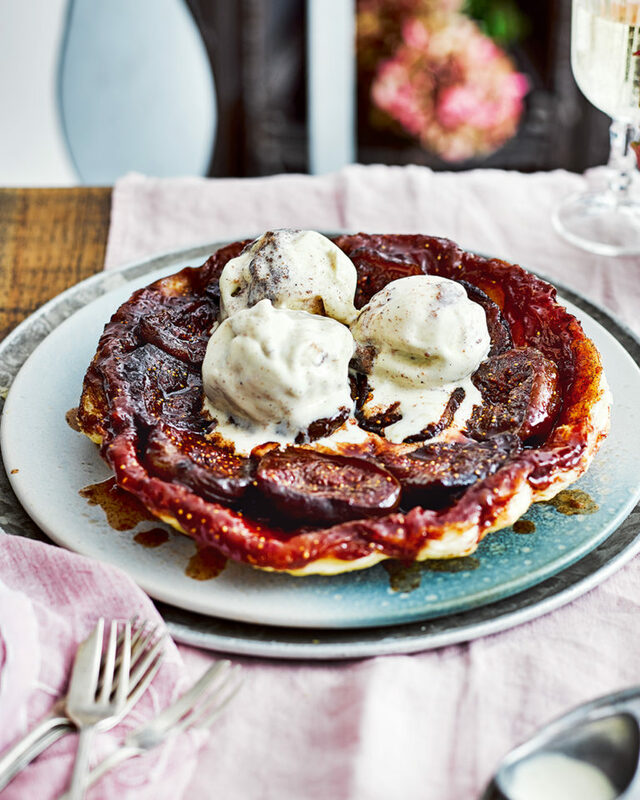 Serve in thick slices with scoops of cinnamon ripple ice cream. Make the caramel and set aside in the pan up to 1 day ahead. Reheat in the pan over a low-medium heat until bubbling, then continue with the recipe from step 3.